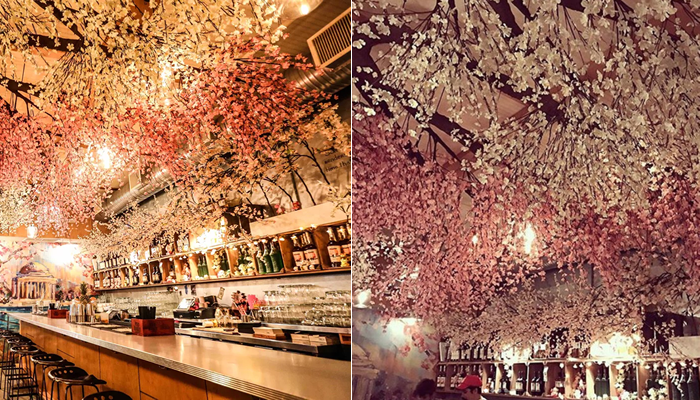 There is a new pop up bar in Washington DC that is embracing a cherry blossom theme, all in time for spring! 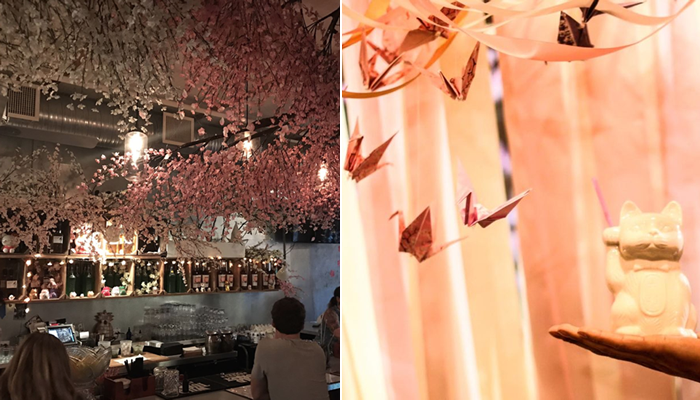 Split into two areas, the venue is situated in Seventh Street and the interior has been themed around a Japanese setting that coincides with the season. The playful environment can be enjoyed for the next few weeks, which is during the same time that the fruit trees blossom, creating picturesque landscape settings in Washington as well as Japan. The same menu can be enjoyed within in both areas of the bar. Both interior themes are an ode to Japan, a nation that is famous for beautiful rural landscapes during the spring season and metropolitan settings in urban areas. Both surroundings are referred to within the two bar areas, not only showing a contrast between both of them, but also emphasising how different rural and urban areas are becoming. On one side, pink and white blossom has taken centre stage along the ceiling where tree branches surround guests. This all seems to allow you to forget that you are actually indoors. Origami (paper folding that is associated with Japanese culture) birds have also been incorporated within the décor, strengthening the theme. Japanese beers are available and cocktails are served in ceramic feline mugs. A true reflection and dedication to Japanese landscapes and cultural heritage. The same theme, a dedication to Japan’s landscape and culture, continues into the other side of the bar. Rather than a reference to nature, this side is a reflection to the urban setting keeping a “district” setting in mind. However, instead of the focus being on their high rise cities, such as Tokyo, the theme that has been chosen to represent this side of the Japanese culture is through the Super Mario Bros. video game. The classic timeless Nintendo game was founded in Japan back in 1985 and has been a worldwide favourite since, with the plumbing brothers becoming part of their national heritage. 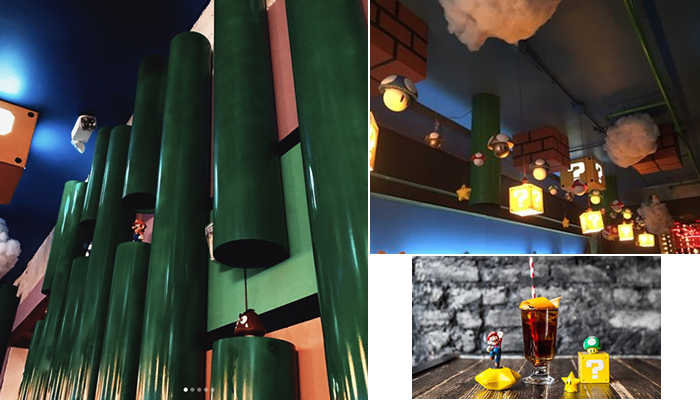 Throughout the “urban area” of the bar space, there are green pipes where characters like goombas, Mario and Luigi as well as piranha plants can be found. Watch out for the fire balls! The theme continues into the lighting with “item box” shades, which are reminiscent to the game itself. 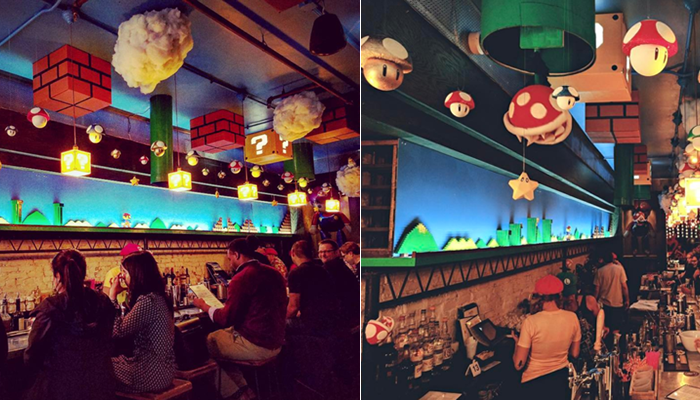 The ceiling space consists of clouds, brick blocks, mushroom characters and Super Stars. The detail of all this creates the illusion of being in the Mushroom Kingdom yourself. The pipes and characters create a representation of the networks and a number of people that come with a district of a city setting. Along the back of the bar, there is a background, presenting what the game used to look like on the big screen. Having this reflect the hustle and bustle of the pipe networks creates an image that is similar to staring into the countryside at the edge of an urban area. Carrying on with the same theme, the staff even wear outfits from the game to represent the heritage and generations of fun that have come with Nintendo. It has become a fun place where you can live out your childhood, whilst enjoying a lovely cocktail (why not try the one that is called “What doesn’t kill you makes you smaller”?). The pop up has also become a place where not only Japanese culture and heritage has been embraced and portrayed, but a space where nature and urbanisation has been combined cleverly in a quirky way. If you live in Washington or are travelling there any time soon, make sure you check it out! The pop up will be open until the 15th of April, which will also be around the time that cherry blossom will start to fall.